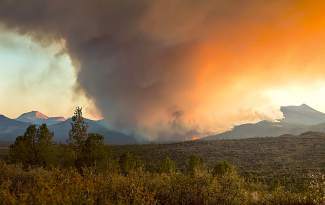 As of midday Thursday, the Eiler Fire had scorched more than 32,000 acres and was 85 percent contained. CORRECTION: This story has been corrected from an earlier version to indicate that Ms. Veseth died in 2012. The Sierra Sun regrets the error. TAHOE CITY, Calif. — A local firefighter is recovering from injuries suffered last week while helping battle the Eiler Fire in the Lassen National Forest. North Tahoe Fire Protection District paramedic/firefighter Tyler Overby was airlifted Friday to UC Davis Medical Center after he was burned on his lower left leg, said Dave Zaski, the district’s public information officer. Overby suffered first- and second-degree burns, and was released later Friday. After he pulled his leg out, Overby said other NTFPD members sprayed water on him and transported him to where the helicopter was waiting. He is now recovering at his home in Reno, and receives outpatient care periodically from the UC Davis burn unit. His recovery could last as long as a month and a half. “We expect a full recovery … he’ll be out for a little while, but he’ll be back,” Zaski said. Zaski said it marks the first time in recent memory a North Tahoe Fire crew member was injured in a wildland fire. Overby, who’s been with North Tahoe Fire since 2009, was part of a 4-member strike team from the district helping hundreds of others battle the fire burning about 4 miles southeast of Burney, Calif.
As of midday Thursday, the Eiler Fire had scorched more than 32,000 acres and was 85 percent contained. It started July 31 due to unknown causes. So far, eight people have been injured in the blaze, which has destroyed seven homes, two commercial buildings and 12 outbuildings. More information on the Eiler Fire can be found here. A day after Overby’s injury, three firefighters from Santa Clara County and 5 Calfire / California Department of Corrections inmate firefighters were hurt while battling a wildfire in Mendocino County. All eight were treated and released on Saturday. Overby and others were reminded of that two summers ago, when 20-year-old Anne Veseth — who was in her second season as a firefighter — died Aug. 12, 2014, when a tree fell on her as she worked a fire near Orofino, Idaho. Veseth and other members of her 20-person crew were trying to extinguish the 43-acre Steep Corner Fire and were establishing and reinforcing a fire line on one perimeter of the blaze, U.S. Forest Service spokesman Phil Sammon told the Associated Press at the time. “It’s a harsh reminder that this is dangerous stuff, and the qualification and safety and training we commit to is paramount,” Sammon said in 2012.